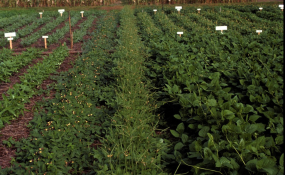 Cowpea varieties in an experimental plot. Accra — Ghanaian smallholders could by the end of this year get access to new, disease-resistant cowpea varieties that mature early and improve yields, says an expert who developed the varieties. "The three newly developed cowpeas with resistant traits to all known races of Striga in West Africa were first to have been reported," says Aaron Asare, principal investigator of the project that developed the new varieties. "These novel cowpeas will sustain the cowpea industry and provide foundation for further breeding and improvement of the crop. "Cowpea seeds may be initially distributed free to farmers if funded and subsequently certified seeds will be produced by seed companies for farmers to buy from agro-shops and Ghana's Ministry of Food and Agriculture." The new cowpea varieties are subject to approval by Ghana's Ministry of Food and Agriculture based on recommendation by the National Varietal Release and Registration Committee, adds Asare, who is head of the Department of Molecular Biology and Biotechnology at Ghana's University of Cape Coast. The project, which began in April 2016 and is to end in April 2019, has partners including Ghana's Council for Scientific and Industrial Research and US-based University of Virginia. The novel cowpeas were developed through classical breeding techniques involving genetic crosses of Striga-resistant parental donor with recipient parents. Michael Timko, a professor of biology and public health at the University of Virginia, says that breeding improved cowpea varieties that are disease- and pest-resistant and can cope with climate change ensures future food security for people in Sub-Saharan Africa. "The lives and livelihoods of smallholders depend on their abilities to produce cowpea for food, forage and economic value, thus having improved varieties is essential," he explains. Richard Akromah, an associate professor of crop science and plants breeding at Ghana's Kwame Nkrumah University of Science and Technology, tells SciDev.Net that the varieties can benefit small-scale farmers who cannot afford irrigation and thus depend on rain-fed agriculture. "During the trials, whereas other varieties were failing due to erratic rainfall patterns, the new varieties were performing better, which would benefit Sub-Saharan Africa due to similar ecological conditions," explains Akromah, who is a member of Ghana's National Varietal Release and Registration Committee.